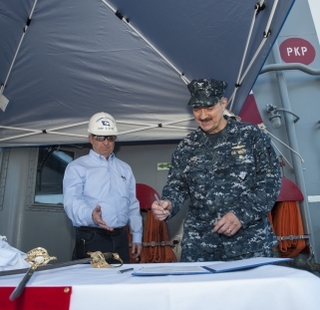 PASCAGOULA, Miss., April 10, 2014 (GLOBE NEWSWIRE) -- Huntington Ingalls Industries' (NYSE:HII) Ingalls Shipbuilding division delivered the amphibious assault ship America (LHA 6) to the U.S. Navy today. More than 900 crew members marched through the shipyard for a delivery ceremony on the ship's flight deck, where they joined Ingalls shipbuilders and personnel from the U.S. Navy's Supervisor of Shipbuilding-Gulf Coast. 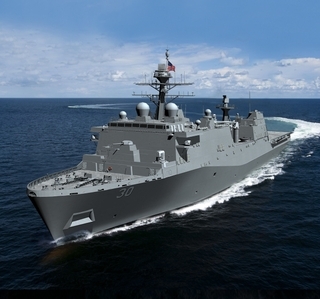 "The shipbuilders of Ingalls have worked tirelessly to deliver this awesome, powerful warship to our U.S. Navy customer," said Ingalls Shipbuilding President Brian Cuccias. "This took more than just doing a job. This took dedication and working to a greater purpose, knowing that our family, friends and fellow Americans could serve on this great ship—the highest quality LHA ever produced by Ingalls." Cuccias read a congratulatory letter from U.S. Rep. Steven Palazzo (R-Miss.). "On behalf of the United States Congress, it is my honor and privilege to welcome the delivery of America into the Navy/Marine Corps fleet," Palazzo wrote. "She brings to the fleet awesome amphibious and humanitarian capabilities. She is lethal, and she is survivable, able to withstand some of the toughest blows our future enemies may have to offer. That capability and survivability were built into this great ship by America's shipbuilders—the men and women of Ingalls Shipbuilding. The best warships the world has ever seen are built right here in South Mississippi." 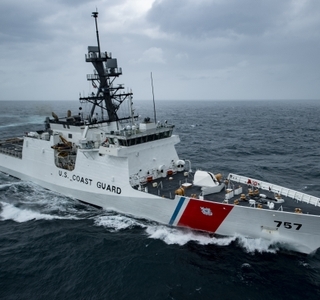 America completed sea trials in February, with no major deficiencies identified. Following delivery, the commissioning crew will move aboard and begin shipboard training in preparation for the ship's sail-away. Commissioning is slated for late 2014 in San Francisco. "To our industry partners, the great shipbuilders of Huntington Ingalls, thank you very much for this incredible warship," said Capt. Robert Hall Jr., the ship's prospective commanding officer. "The pride you displayed in building America, a ship named after our great country, was evident every day. You put your heart and your soul in providing me and my crew with the tools we need to do our nation's work. We pledge to sail in her confidently, professionally and proudly in service of our country." When America enters the fleet, she will be the flagship of an Expeditionary Strike Group, strategically positioning Marine Expeditionary Units ashore across a full spectrum of missions, including humanitarian, disaster relief, maritime security, antipiracy and other operations while providing air support for ground forces. America-class ships are 844 feet long and 106 feet wide and displace 44,971 long tons. The gas-turbine propulsion system will drive the ships in excess of 20 knots. They will accommodate a crew of 1,059 (65 officers) and 1,687 troops. The America class will be capable of carrying a Marine Expeditionary Unit, including Marine helicopters, MV‐22 Osprey tiltrotor aircraft and F‐35B Joint Strike Fighter aircraft.